Light Painting Images can create great effects. But without knowing what exactly the tools can create nice Light Painting, you will be not using the full potential. The basic is that, we need a DSLR with Cable Release. Cable Release can be very basic costing just under $50 dollars. The basic we control is the exposure with manual override. If the background is not dark, it will be difficult to work. Lens needs to be a responsive lens. A good tripod is almost mandatory for proper composition and stability. These are the non light resource part of Light Painting Images. Electroluminescent wire (or glowire) are quite nice tools as resource as for certain Light Painting, you will need a kind of continuous well defined lines of light. They does have limitations, at high frequency it dissipates a lot of heat and that can lead to breakdown and loss of brightness over time. Second kind of tools are actually LED based toys – this includes Glow Sticks, Light Sabers and Swords. Third group are real light resources – various consumer grade Laser tools, LED torches etc. The most important tool for Light Painting images is the creativity. Because of limited field of experiment, it demands the power of imagination. This Article Has Been Shared 3333 Times! 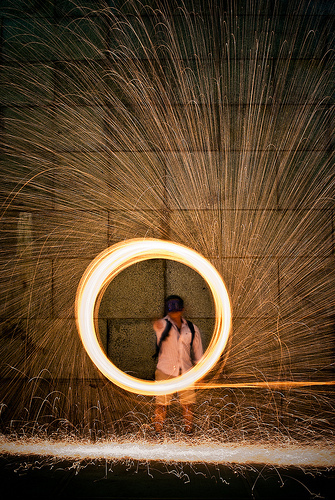 Cite this article as: Abhishek Ghosh, "Light Painting Images : Tools and Tips for Digital Photography," in The Customize Windows, March 21, 2013, April 26, 2019, https://thecustomizewindows.com/2013/03/light-painting-images-tools-and-tips-for-digital-photography/.